Copley Plaza Hotel in Copley Square. The Copley Plaza Hotel is bordered by the Hancock Tower, Trinity Church and the Boston Public Library. A busy morning starts and your shot is perfect, I liked a lot the view, everything there is so clean! Very elegant way to stay in Boston, I think this hotel is traditional and charming! A beautiful old fashioned hotel and a nice view on an elegant and lively square. I'm currently reading books of Dennis Dehanne, which take place in Boston; An other way to discover your so pretty town! What a beautiful old hotel! I really like those red awnings. Grand place, any chance of seeing a wee bit of the inside? I think what i find fasinating is that some of the older buildings that still sit in Honolulu are constructed EXACTLY like this. They are smaller but the design is the same. The first settlers who came to Oahu where from Boston and they left beautiful buildings and homes in the area! 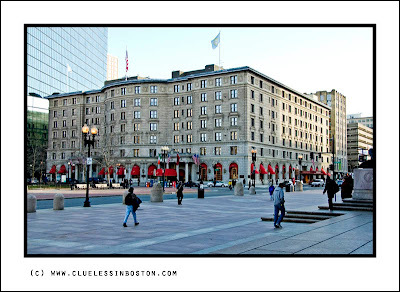 When i visit Boston, i am taken back to my childhood when these buildings abounded in Honolulu! We thought modern construction was progress HA I dont THNIK SO! beautiful pic! Great photo! You do a great job with your compositions. It's always nice to see old hotels that aren't towering over the cityscape. Great composition! And I love the red colour in it.